At Air Duct Cleaning Katy we are proud to provide quality air vent cleaning and sanitation services to all of our customers. Our company employs technicians who are highly skilled and experienced to ensure that each of our customers can enjoy indoor air flow that is free from contaminants, and vents that perform optimally. So, give us a call today to find out more about our services. To determine whether or not your ventilation ducts are performing as they should, it is a good idea to have a technician conduct an indoor air quality test in your home or office. This is because a ventilation system that has taken on too much dirt, will likely raise the levels of contaminants in the air, a problem which can only be solved by having it sanitized. So, speak to us today to have the quality of air in your home or office tested today. When mold takes root in ventilation systems, it can be incredibly difficult to remove. What is more, its spores might be spread around your home or office where it can take root in upholstery or cause allergic reactions such as breathing and skin disorders. 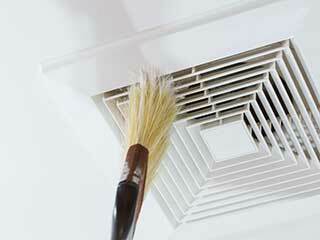 If you suspect that you have mold in your air ducts, don’t hesitate to call on us for assistance. With consistent use, your dryer can quickly collect an excess of lint and dirt which will not only effect its performance, but may also lead to a fire hazard since lint is extremely flammable, and your dryer gives off a lot of heat. For this reason, venting a dryer is absolutely necessary from time to time. If you require assistance with his matter, be sure to contact one of our technicians for assistance or advice. If you are looking for air vent cleaning services that you can rely on to keep your home or place of work fresh and free from harmful contaminants, while ensuring that you get the best possible performance out of your system, be sure to contact a technician from Air Duct Cleaning Katy for assistance, details on our services or advice on your system. We are happy to help and are waiting for your call.